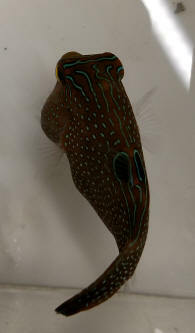 A Corallimorph of light blue and grays and browns. There are whole classes of negative chemical reactions possible between fishes and non-fish livestock. 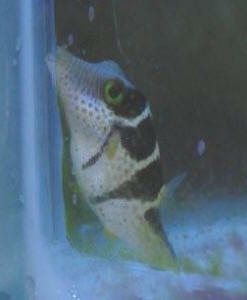 Recently I bought a blue dot Toby puffer that seemed to have a mild goiter. It was in a copper-treated quarantine (2.5ppm plus hypo at 1.015) for the last two weeks and seemed to be doing fine, albeit a little sluggish, but this morning I found it dead. 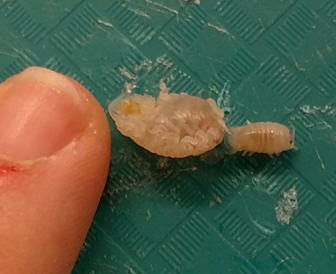 In my experience a dead puffer with a bulge that won't go down is a sign of gill parasites, and lo and behold, a necropsy revealed a pair of gigantic isopods wriggling away inside a very warped gill chamber. 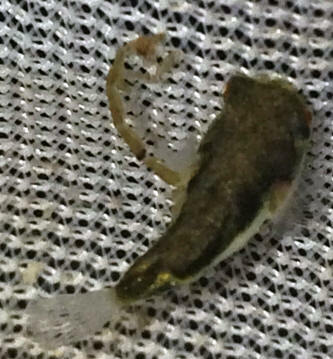 If the copper and hypo didn't kill them, is there anything I can do to help a fish with this kind of parasite? them, though this is the second time I've seen them pop out of a dead Toby. 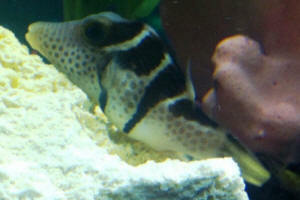 I've attached pictures of the puffer from when he arrived, plus a photo of the isopods. Thank you for your help as always. Hello and thank you in advance for any advice you can give me on how to deal with this unfortunate situation. with the Toby (named Lil Puff) are, a Green Wolf Eel, Snowflake Moray Eel, Immaculate Puffer, 3 Camel Shrimp, and a Coral Banded Reef shrimp (various clean up crew). though the camel shrimp are the size of his head, he backs away and runs to other side of tank when encountering one. I share this information because I believe my Little Puffer sustained an injury to his eye. The night before his eye was perfect just like him. I've looked up some information but can't say for sure if it is a bite from a tank mate 100%. However, judging by pictures it seems so. Little Puffer is comparable to Dennis the Menace or a Curious Cat. He's got not fears. If we are trying to get him away from something in the tank for whatever reason with a net (rarely and gently of course), he moves as slow as possible and barley flinches. I guess I make these points trying to emphasize Little Puff has never been in a dangerous situation or lived in fear of any tank mates. For whatever reason, the bunch we have balanced each other well. The Big Puffer (Immaculate Puffer) has a large mouth, and on occasion regardless of putting two brine cubes in for them, they would both go for the same one. cause harm to Little Puff. Just in case, our water quality is OK. We have been battling high nitrates since about three months into the tank and have yet to get that down to a "safe level." Even so, our fish have thrived, are active, colorful, and great appetites. Our PH is 8.2. Ammonia 0 Nitrite .25. Ok on to the actual injury here. I apologize if this is too lengthy or too full of unnecessary information. I tend to get too detailed! I woke up yesterday and noticed Little Puffer in the top corner of the tank on his side. Without thinking too much of it, I dropped the cubes of food in like I always do. Normally, Big Puff and Little Puff are zipping up and down the glass in the corner next to our fridge, making chomping faces at me. They know I'm headed to the freezer for their food! When I saw even with the food in Lil Puff hadn't moved I got a closer look. I noticed his one eye had white around and when it became clearer, that it almost seemed as if it had been pulled out. It was quite shocking. Basing my guess solely on his eye being perfect the night before, (I take a lot of pics of them, at least 200 night before of his eye perfectly fine) and what appear to be a possible bite mark above his eye on his "head", I assumed someone accidentally took a bite. It did not seem that brutal, which again leads me to believe some one didn't mean to do it. I guess it's always possible something mechanical did it. Bothers me not to know, but I'm guessing how really doesn't matter. He's turning his body so his belly is facing up and almost riding the current. He does this for maybe 30 seconds, sometimes he floats into a rock or the glass, and it seems to almost snap him out of it. He will shoot back right side up... Swim slowly towards the front of the tank, then go back to floating. Either upright or on his back. His belly looks tight and almost bloated with many ridges. He's belly rarely looks that way on a normal day. As the day went on and overnight into today, his eye has become much, much worse. Just several hours ago it was very white, clearly almost moving further away from the socket. Oddly enough, his color seems great and his other eye is perfect. I tried feeding this morning again and food went right by his mouth and he didn't eat. forward, then goes backwards again. Nonstop. I'm so, so, so, concerned. Little Puffer is the toughest little fish I know. We've never had one injury, illness, or fight in our tank and it's killing me that this has happened to him and I don't know how to make it better!!!!!!!!! I don't know what to do. Do we try antibiotics? Should he be moved or will that stress him? One thing Little Puff is, is dramatic. If we move a rock from one side of the tank to the other, he's in the corner against the glass or swimming around blotchy and with his bug eyes. He's very sensitive to change so I worry about taking him out of his home. I just want to know if he can survive this. Or should we be making him as comfortable as possible. It's literally breaking my heart to see such a hyperactive, giddy, funny, and energetic fish slowly fade away. As of now, my plan is visiting my LFS to see what they recommend. I trust them there and they've always given us great advice. Never trying to sell something. Good people. Then when my boyfriend gets home and is able to assist me, I think we will be moving little puffer into a hermit tank we've used before for temporary isolation (not when I'll). If Little Puff is going with the water flow he can cause more damage. I'd rather he be protected by the four walls without having to be on edge he's about to hit a rock or the Coral Banded. I read some people turn off their pumps or filters. I'm not sure that's a good idea and our Immaculate is pretty dependent on a strong current to swim against. Without it he would just sit on the sand bed. I just want to make sure I've covered my bases and given you guys enough information to reply to my need for help in one shot. Although, I'm sure I jinxed it and I'm missing some huge important bit of information! Thank you! Thank you!! Thank you so much for getting back to me so quickly. I posted on other forums and still haven't gotten a response. I'm so grateful for your experience and prompt response. This has been a stressful two days! I just wanted to ask a few more questions if that's alright? I read up on the Epsom salt treatment and I'm glad to know we can perform it in our main tank. We do have an Octopus still in this tank. I left her out of the earlier list because unfortunately, she entered senescence about 3 weeks ago after laying eggs. She's barracked herself into a tiny spot between the rocks and hasn't come out or eaten since. While our Octopus (Inky, Abdopus aculeatus) is nearing the end, we still do not want to do anything to cause any harm or pain. This is our second Octopus and senescence seems rough enough. On the other end of things, Puffer has a real chance and is our main concern. Will this be safe to perform with Inky in the tank? We were coincidentally due for a water change today. Should we perform it first and then do the salt? I saw one post said every three days and another said only once, which is correct? Lastly, I just wanted to send you some more recent and detailed pictures of Lil Puffs eye. I'm no expert and I tend to overreact.... But to me his eye looks shredded. Like it is tearing at the seams. Is there a any hope of it healing completely? Is it past the point of treatment? It just seems so awful and it just hurts me to see. Even having an Octopus (they are truly spectacular), Lil Puff to me is the prettiest fish out there. When he looks at you straight on, he seems to smile at you. I hope none of my questions seemed redundant and I apologize if they are. I truly appreciate the time taken to read my information and to recommend a response to the situation. I just really want to know what to expect once we treat with the Epsom salt. Should I be expecting it to fully heal or just stop getting worse? Mate; your 17 meg email is being deleted. RESIZE your pix to a few hundred Kbytes and resend. Haysus! up and running for a long time approx 5 years. The night that we bought the puffer we had a power outage. The temp in the tank dropped, I don't believe it was below 70 degrees Fahrenheit, but it did drop. 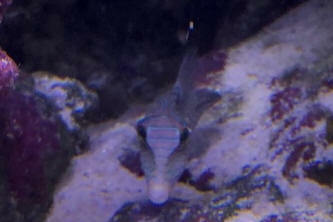 We noticed that the fish was acting very lethargic ( I am guessing from distress). After power returned the temp rose into normal range about 75 - 77 degrees. At this point he was swimming normal but not really eating like our porcupine puffer does (this puffer is in a separate tank). Tonight we noticed that he has developed a large spot" on his side. I am not sure if it is an ulcer, or a bruise, or a scrape. 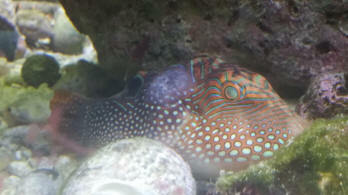 He is also not acting very energetic (laying around near the bottom) and his breathing seems labored, erratic, and fast. Any advice would be appreciated on how to treat or what we can do to help him out. I am attaching some pictures for your reference. Was you able to get my last email? I only sent 2 pics each about 700kb? a 210 gallon Fowlr tank with a custom 70 total gallon double sump. Water parameters have always been spot on. The tank has been running for about two years or so. There are no new fish added. Everyone else is healthy. He has been super healthy and a very vibrant colorful active Fish this whole time. Friendly enough that he'll eat from my fingers. He even would eat the seaweed off the clips as well as chewing on the Marine grazers from new era. I don't feed live fish to him because of the risk. Almost 2 weeks ago he suddenly stopped eating. I ended up removing him to a 20 gallon quarantine tank after he started losing weight and getting pale spots on his body. I treated for several hours separately during quarantine with Bifuran because he was still looking bad and not eating. He still comes to the front of the tank but definitely a little more sluggish. Not eating whatsoever. Very thin and still has pale spots all over his body. His breathing doesn't seem to be labored like some fish get on their deathbed though. Wasn't sure if he had trapped air so I even tried burping him gently during quarantine. Any help or ideas would be appreciated. Hate seeing him suffer. 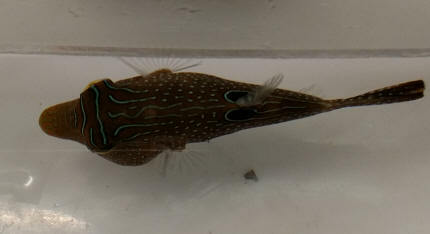 <Need a bit more info... re other tankmates (that ARE doing well; that might be beating up this Canthigaster)... I suspect, as you've had this fish a good long while; that this is NOT an internal or pathogenic, nor genetic issue, but likely nutritional. Common for puffers to give up feeding, look badly fed on foods too rich in Thiaminase... leading to a B1 vitamin deficiency. I've Had this little Ocean puffer that arrived with a water change he seamed fine but them I noticed he has what looks like a baby shrimp or a tentacle sticking out of its side I've Googled it and nothing can you please inform me on this please. I have a puffer with a black worm looking thing coming out of his mouth..I don't know what it could be..
<Wish this image was better resolved... but does look like this Toby is eating something worm-like. I wouldn't panic. That's what we thought...But it has been there for a week. I am at a total loss with my little Valentini She spends a lot of time sitting in the sand and she has not been eating like she normally does. I have had her for 1 1/2 years and she has never acted like this. It started about a week ago and at first she was constipated. She was pretty rounded in the back end and I did not see any poop for a couple days. Did the Epsom salt and within 36 hours, she was pooping, but still sitting in the sand and not a huge appetite. Did some searching on some various sites and based upon another post, I thought her teeth might be more overgrown than I realized. Did the teeth trimming and still no change. Any input would be most appreciated. Some leathers, mushrooms frog spawn and a few candy cane heads. Some Nassarius snails and some turbo snails. No other fish and nothing new has been added to the tank since January. 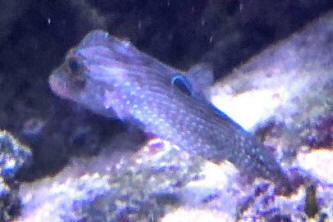 I've had a C. Papua in my marine aquarium for almost a year now. His was put in QT for 12 weeks before placing him in the display and treated for IP. The LFS we purchase from had also treated him with copper before we purchased him. 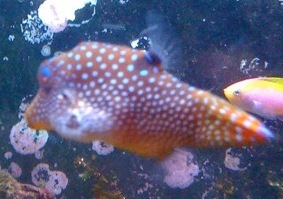 He was a very personality filled fish that was always being goofy and ate well, including my inverts (as expected). However, in the last several weeks though he has become shy, is not eating well, seems to have his mouth stuck open like he is panting almost and has formed a lump just behind his right pectoral fin. He has lost a considerable amount of weight now and is very skinny--very different than his previously round/plump form. Puff is the only fish in the tank, but we have a number of snails, two peppermint shrimp I thought would be dinner for him, several hermit crabs and two corals (also though these would be goners but they remain--Duncan and candy cane). Water parameters are within normal ranges, water changes are done frequently with RODI water. We feed clams on the half shell and Mysis shrimp as he will not eat Nori, in-shell shrimp, or anything else we try to give him. His top teeth seemed of acceptable length, but I was able to trim a sliver off in case that was part of the issue. It does not seem to have helped. I'm at loss as to what could be wrong with him and hope perhaps you could shed some light on other steps that we can take to help him. Something is clearly very wrong. I look forward to your response! Thanks, Bob. IP is an abbreviation for internal parasites that is used on some of the forums. I picked up some iodide today and already have Selcon that we use when feeding. The fish shop I stopped at didn't carry any vitamin products so I will need to try another one. Hopefully the iodide and Selcon combo helps the little guy. I went and purchased the Seachem Reef Iodine and soaked a piece of scallop with 3 drops of the iodine and a few drops of garlic guard. I gave her the scallop and she did gobble a few bites. I will continue to do this with her food/feelings in hopes the lump goes away. Would it be of any benefit to add any to the tank water? I love your site and spend hours researching and reading through the different topics. I have a question I have been unable to get any real answer for on your site as well as doing an advanced search on Google. I have a 3 inch Valentini Puffer in a 30 gallon tank with numerous Ghost shrimp and 1 Emerald Crab for almost 3 months. Water parameters (Ammonia, N02 & N03) are all 0. PH is 8.2, salinity 1.024 and I do a 33-50% w/c weekly. She has a great personality (aside from her unique sleeping spots, which almost gave me a heart attack the first week). She definitely recognizes me to beg and preen when I walk by the tank. My main concern is the amount of food I should be feeding her. I feed her in the morning and after dinner and she will eat almost anything I feed her, but never more than 3-4 bites. She will beg all day and when I get ready feed her, she swims right up to the front where she gets her meal, take 3-4 bites (like she is famished) and swim away. If I stay there and try to offer her more, she does a couple of laps, comes back to the feeding spot, looks at the food and swims off like she is mad. This can go on for several minutes until I figure she wants no more. But as soon as I walk by the tank, she swims right up and begs for food. In the beginning, I would get the food back out and we would go through the routine again, but never eating anymore food. How much should she be eating and what should I be doing to ensure she is getting enough? I initially started out using 10 inch tweezers to keep as much waste from ending up on the bottom of the tank. I then tried dropping it into the tank, thinking she might prefer to pick at her leisure. But always ended up having to fish the food out in the evening so it would not spoil. I even tried taking a variety of frozen pieces of seafood and peas, chopping them up fine and spreading the mixture on waxed paper, freezing and then breaking off pieces to feed her so she would have variety, but 4 bites and she is off swimming. Here is a photo of her on her favorite rock taking a nap. 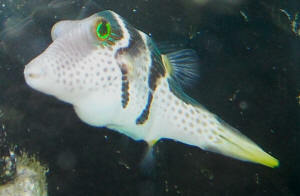 I think she is healthy, but she is just such a pain to feed compared to my Green Spotted Puffers. I have 2 in a 75 gallon tank and the eat like it is their last supper. Any help, suggestions or insight would be most appreciated. 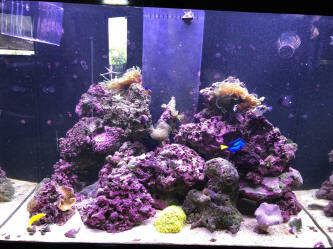 We recently (about a week ago) got a Valentini for our fish only aquarium w/ live rock. He is in a 40 gal with a clown, Royal Gramma, and Henoculous(spelling?) 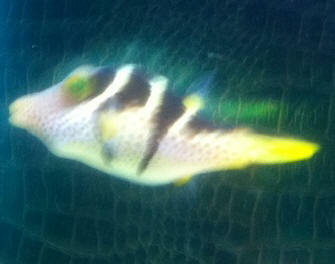 Butterfly fish. (safe according to the testers) and the tank is due for a monthly water change so I didn't find it unusual. 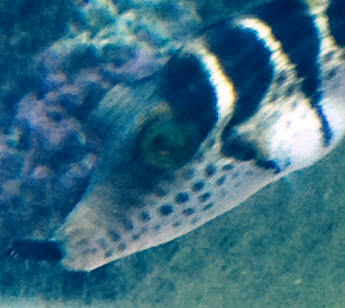 Today, the puffer started swimming at the surface with his eyes nearly out of the water and wouldn't eat. The Puffer has been eating a variety (Mysis, brine, flake, and pellet veggies) regularly two to three times a day until today. I am doing my monthly water change tomorrow and hope this fixes the problem but I just wanted to know if there is anything else I should do. I will pick up some other seafood based foods (clams, etc) when I go get the water tomorrow. Is this something I should be more concerned with? 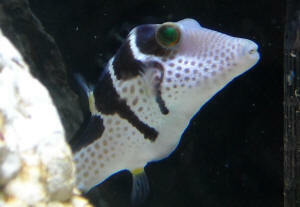 Mick Jagger, my blue spot puffer, has a nasty injury to his side. He has only been in the quarantine tank for three days. 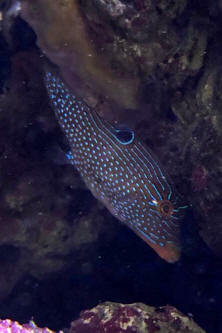 He is with a Bartlett's Anthias and a very mean, Green Chromis. There is one Chili Coral acclimating as well. Could the Chili Coral have stung him? Did he get beat up by the Chromis? or Did he inflate during transit and get air stuck? but I am not sure how to treat him. He is eating like a little piglet, and the injury is not affecting his ability to swim. I am writing for help because I am an idiot. find a fish. He was in the back, on the floor. I don't know how long he was there. I didn't realize puffer's liked to jump. I had to scrape him out from behind with a long stick (I'm sure it didn't feel good.) I cleaned him off, dirt, debris and lots of dog hair. I floated him nose up because he was full of air and got some bubbles out of him. I swished him around for about five minutes plus, and he just wasn't breathing, he was DEAD. So, I stupidly fed him to my long tentacle anemone (in another reef tank). out. His fins are really raggedy. I think he may have post traumatic stress syndrome. I want to quarantine him in a little pico/hospital tank I have so I can do daily water changes and watch his food intake because I am dumping too much food into his regular tank and fouling the water. He won't eat and he needs nutrition to heal. Can you please suggest a mild anti-bacterial that I can put in the quarantine tank that will make him heal up faster? Thanks Bob. I bet you got a laugh out of this drama. I sure did when I re-read it anyway. I've got Furan in the Medicine cabinet. Puffy is still doing well. 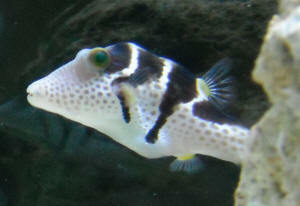 I recently wrote regarding a bicolor angel in a 30 G tank with a Valentini puffer and goby. (the tank has a 55 G tetra carbon filter on it. water and filter media was changed less than a week ago.) 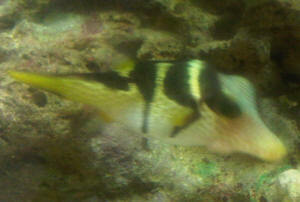 The bicolor was a new addition to the tank, after less than a week, he developed cloudy eyes and nipped fins. I did a water change, but the Wet Web Crew informed me my tank was too small. The bicolor was brought back to the store it was purchased from (and has since passed). Now, about a week later, my poor Valentini is acting a little strange. He is resting, a lot. when he does swim, he scratches himself on the rocks frequently. I have never seen him do this. And now, as I type this email, he has a bulge on his ventral side, just below his pectoral fins. :-( I took a picture of him and will be attaching it. I have had these two fish since I bought my first fish tank. I am going to be pretty devastated if i loose him. Oh no! I sent the wrong picture! that's an old one. Attached is a picture of the weird lump. He is hiding out now. Curled up on the bottom, in a cave in the rocks. <Along with your reading assignment, add "goiter", "iodide" to the search. We have 2, 125 gallon tanks, housed in one stand, one on top of the other. The top tank is well established with 120lbs of live rock, some hairy mushrooms and a large toadstool...haven't been picked on in two years and doing great. 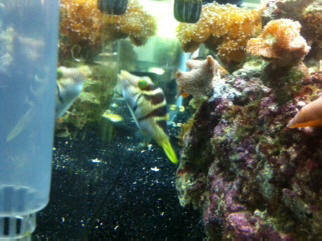 The fish are a Porcupine Puffer, Stars and Stripes Puffer, Unicorn Tang and a Fox Face. Both tanks run off the same sump and were filled at the same tank but the bottom one only had water in it. The bottom tank is now just getting started and it only has 50 lbs of live rock so far, a few corals and the fish are a Valentino Puffer, Kole Tang, 2 Square Anthias (male and female), 4 Pajama Cardinals. The Valentino Puffer used to be in a tank where he got picked on pretty badly and had one of his little arm fins ripped right off. so we moved him to the tank he's currently in. He hadn't eaten for 6 days when we moved him. He started eating right away and does still seem to be eating and isn't getting picked on at all. But for the past couple of days he looks as though his belly is distended. Is this possibly from not eating enough? one. Really don't want to lose him. He's a really nice fish. Water parameters are as follows: PH is 8.11, nitrites, phosphates and ammonia are undetectable, calcium is 440, magnesium is 1400, KH is 11 and nitrates are approximately 35. Very high. This is right after two large water changes. Could the nitrates be affecting him? Are we able to add anymore live rock or will this make our situation with the nitrates worse? Any help you can offer would be appreciated. Thanks! I wanted to thank you for your informative website. It's been very helpful to new aquarists like myself in avoiding major blunders. However, we recently added a Valentini puffer to our 65 gallon aquarium and after four days, he has become lethargic and keeps his tail curled. This has been a change from his previously bouncy personality and I read in one of your forum posts that the curled tail is a sign of illness. None of our other fish seem affected and, in fact, the only other possible symptoms are his lack of appetite and somewhat hazy eyes. Our ammonia is at .25ppm and our nitrates are at 20ppm - high and we are doing additional water changes to help with that. Our salinity has been steady at 1.022 and our temperature has always been 75. What recommendations to help our Valentini would you have? Would a freshwater dip help? Any help or guidance you could give would greatly help - we need it!! !